Be the first to share your favorite memory, photo or story of Luigina. This memorial page is dedicated for family, friends and future generations to celebrate the life of their loved one. 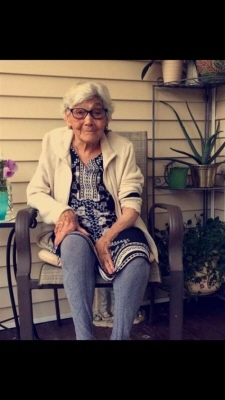 Luigina (D’Amico) DeGiovanni, age 90, passed away peacefully on Saturday February 9th surrounded by her family. Beloved wife of the late Pietro DeGiovanni. Born in Calabria, Italy. She was the daughter of the late Luigi and Carmela (Paletta) D’Amico. She enjoyed gardening, cooking, and spending time with her family. Surviving her are three sons, Vincenzo DeGiovanni and his wife Marietta of Westford, Frank DeGiovanni and his wife Maria of Medford, Salvatore DeGiovanni of ME; three daughters, Maria Caruso and her late husband Frank Caruso of Canada, Carmela Langford and her husband Jerry of CA, Teresa Cerro and her husband Antonio of Beverly; two sisters Francesca Paletta of Italy, Maria Paletta of Italy, fourteen grandchildren and seven great grandchildren. She was predeceased by a brother Enrico Paletta and a sister Filomena D’Amico. To send flowers or a remembrance gift to the family of Luigina DeGiovanni, please visit our Tribute Store. "Email Address" would like to share the life celebration of Luigina DeGiovanni. Click on the "link" to go to share a favorite memory or leave a condolence message for the family.